Snowboarder Cody Mendoza makes fresh turns in powder after six inches of snow fell at Breckenridge Ski Resort Wednesday night into Thursday morning. 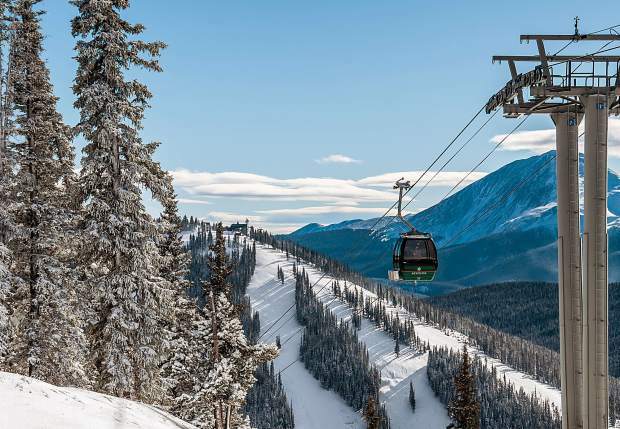 The Outpost Gondola at Keystone Resort transports passengers on Dec. 8. Fresh powder covers terrain at Breckenridge Ski Resort Thursday morning. North Peak at Keystone Resort is in view on Dec. 8. 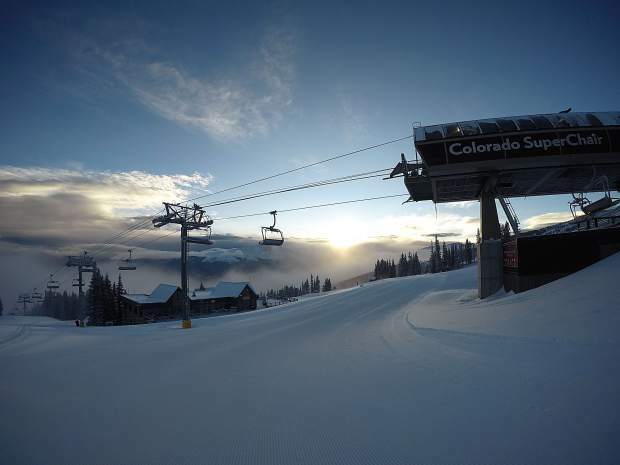 The Colorado SuperChair at Breckenridge Ski Resort is in view the morning of Dec. 8. 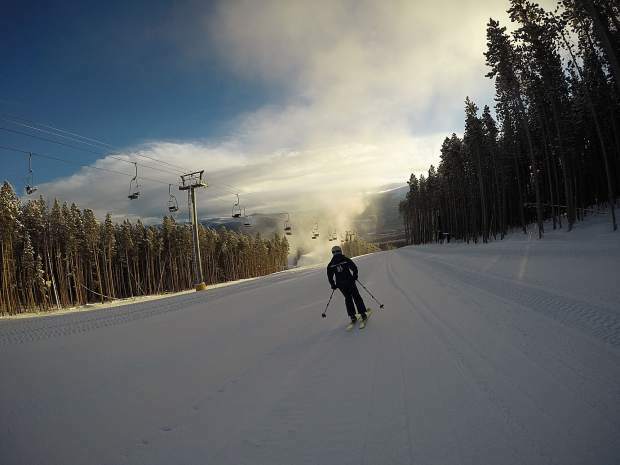 A skier makes turns at Breckenridge Ski Resort on Dec. 8. 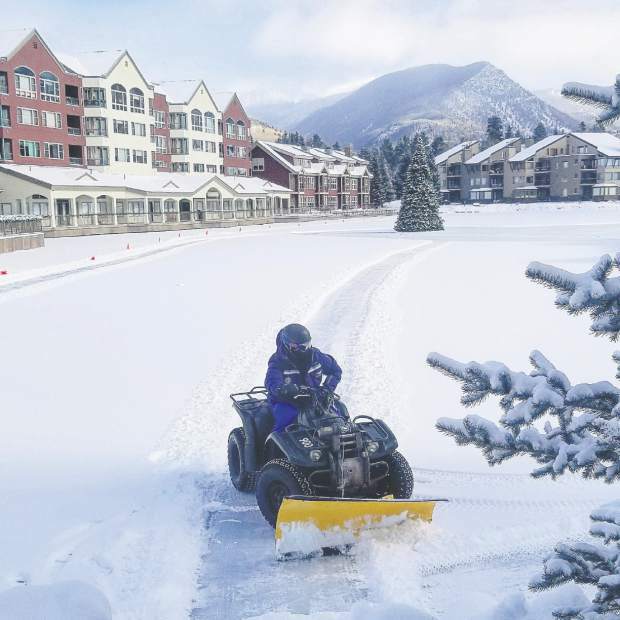 Snow is cleared at Keystone Resort's Lakeside Village Thursday morning. 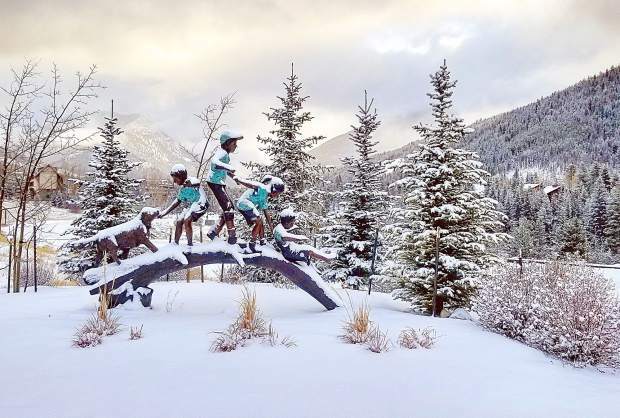 Freshly-fallen snow clings to statues at Keystone Resort Thursday morning after four inches fell since late Wednesday night. Halfway through December, the snowstorm that struck Summit County late Wednesday night into Thursday morning bumped up the opening of the Lower 4 O’Clock and Gondola Ski Back trails at Breckenridge Ski Resort, in turn providing skiing and snowboarding access from the resort into town. Meanwhile over at Keystone Resort, the storm helped open an additional intermediate run out on its North Peak terrain. Breckenridge has 280 acres currently open across Peaks 8 and 9, as the resort anticipates opening Peak 7 to skiers and snowboarders very soon. The two resorts have also outlined their tentative plans for the holiday season, as early next week Breckenridge plans to open its Mercury SuperChair leading up to Peak 9 terrain as well as Peak 7 terrain and the Independence SuperChair for skiing and snowboarding on the intermediate Pioneer Trail. 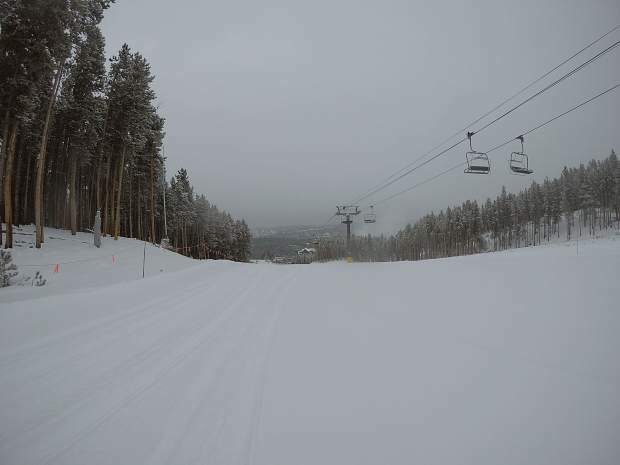 Breckenridge reported receiving 6 inches of new snow overnight while Keystone reported 4 inches. The conditions helped each resort, as Keystone Resort spokesman Russell Carlton initially said on Wednesday that Breckenridge planned to open Lower 4 O’Clock and the Gondola Ski Back trails on Friday to provide skier and snowboarder access from the resort into town. That plan changed Wednesday evening, once the snowfall forecast became clearer. 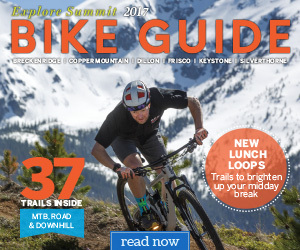 Carlton and Breckenridge spokeswoman Sara Lococo added that Breckenridge plans to open its intermediate Columbia trail on Peak 9 for Saturday. And Breckenridge’s newest restaurant, Pioneer Crossing, which serves crepes, will open when Peak 7 opens for the season. Keystone’s opening of its Anticipation trail and Wayback chairlift on Thursday pushes further open terrain off of the resort’s main ski area, Dercum Mountain, as two blue runs off both sides of the 11,660-foot North Peak are now available for skiers to access. Carlton added that the resort on Friday plans to expand its Schoolmarm Family Ski Trail through the currently closed beginner trail Last Chance on Dercum Mountain. And on Saturday, Carlton said the resort will open Dercum Mountain intermediate trails Flying Dutchman and Paymaster while the intermediate I-70 terrain in the A51 terrain park is also slated to open. Those openings would push Keystone to more than 300 acres of skiable terrain, as the resort currently sits at 237 acres open. As for black runs at Keystone, the Bergman Bowl is not currently available for hike-to access for expert skiing and snowboarding. And the resort will celebrate the opening of its new 190-seat indoor Labonte’s Smokehouse BBQ restaurant, accessible via skiing down the Anticipation trail on North Peak, on Friday from 10:30 a.m. to 2 p.m. 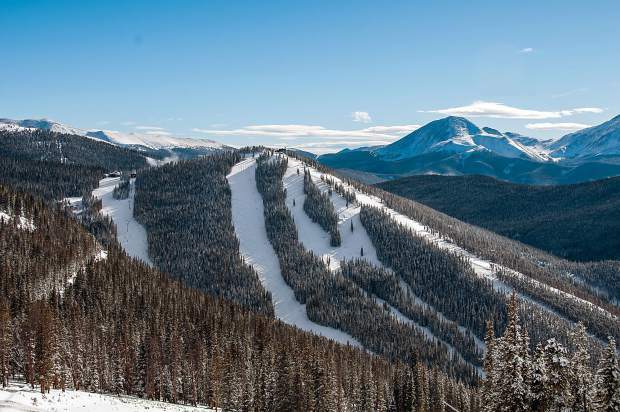 Following this weekend and prior to Christmas, Keystone is looking to open terrain at the 11,980-foot The Outback, as well as additional trails on Dercum. Keystone will bump up its opening time to 8:30 a.m. this Saturday. The resort will also open its night skiing for this Friday and Saturday, as the resort will be open until 8 p.m. Friday and Saturday before returning to a 4 p.m. close Sunday through next Tuesday, Dec. 19. Breckenridge will start its 8:30 a.m. opens on Friday. 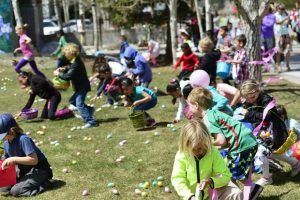 As of Thursday afternoon, Copper Mountain Resort had a comparable amount of terrain open to its guests versus the Vail Resorts, at 225 acres. That includes single black diamond terrain Rosi’s Run over in East Village off of the Super Bee chairlift as well as intermediate runs Oh No, Skid Road and Andy’s Encore in the same area. Terrain in East Village had been closed off until recently as the U.S. 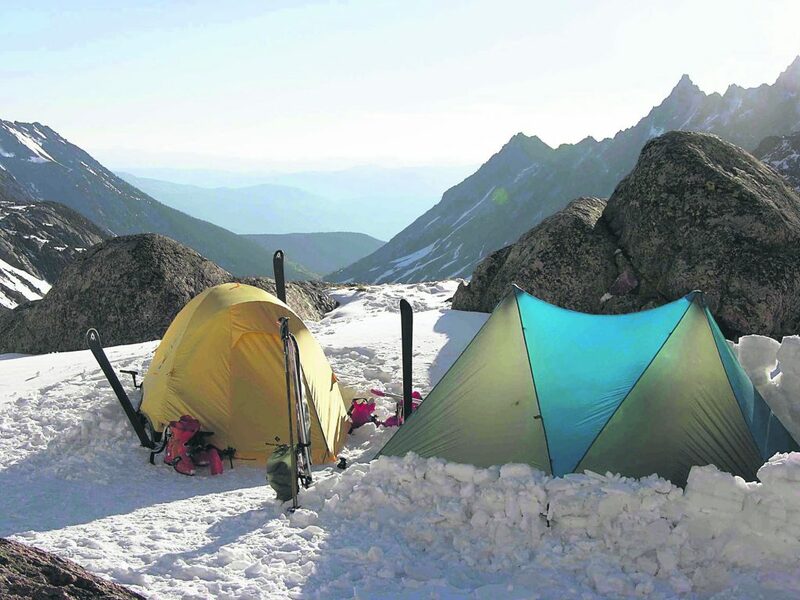 Ski team was using it for early season training. In all, Copper also has 16 other trails open currently: intermediate runs Rhapsody, Max Vein and Bouncer (L) off of the American Eagle lift in Center Village; intermediate run Wind Song and the beginner run Minor Matter off of Timberline Express in West Village; intermediate Copperopolis and Ptarmagin off of the upper mountain Excelerator lift; beginner trail Green Acres off of the Pitchfork lift (as well as the Easy Rider learning area); beginner terrain Easy Road Too and High Point off of the American Flyer lift; and beginner trails Snodeal and Vein Glory (L) and (U) off of the Union Creek lift. 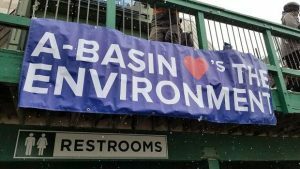 In their Thursday morning snow conditions report, A-Basin staff teased a wave of openings in the later half of the month, that is, if Mother Nature cooperates. 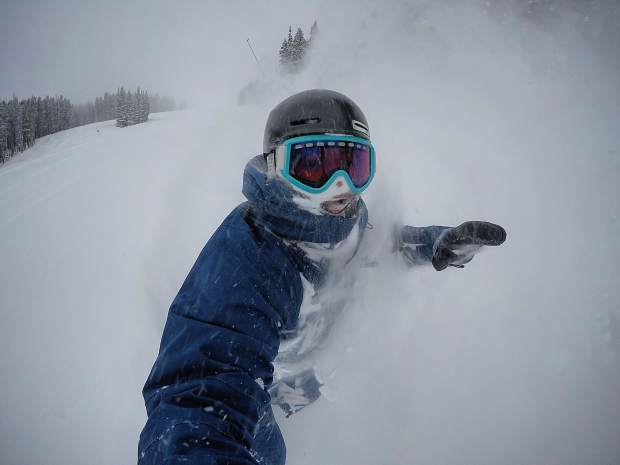 As of Thursday afternoon, A-Basin received 3 inches in the past 24 hours and remained at 10 runs open, including intermediate runs Lower Mountain Blues and Upper Lenawee. Earlier this week, A-Basin chief operating officer Alan Henceroth wrote on his blog that this season has been good for snowmaking in part due to ideal water flow on the North Fork of the Snake River. Henceroth added that A-Basin is allowed to divert water through Dec. 31 of each season. With that, Henceroth said A-Basin’s snowmaking priorities as of the beginning of the week included terrain around the currently closed Norway lift, such as the Treeline and High Divide terrain parks. Another priority is The Void, a shortcut from Ramrod to the bottom of Pali just above the Molly Hogan lift. The COO added that the High Divide terrain park will have new features while the Treeline park will have a new build.